As you’ve probably noticed from some of my posts, I recently started blogging for the fantastic Christian women’s blog, Satisfaction Through Christ. It has stretched me as a writer and opened an article door I’d never considered knocking on before: writing recipes. And I love it! I like to cook and experiment with different foods and techniques. I like to collect existing recipes and tweak them until the’re my own. And sharing that with others is just plain fun! Not long ago, I posted a recipe for cinnamon rolls that got a great response, social media-wise. People shared it on Facebook and Pinterest, the article itself got several comments, and it was even the most viewed post of the week on another blog that linked to it. It was awesome, and I’m so grateful to everybody who shared it. Reading and collecting (and, for me, writing) recipes is fun, and can help me serve my family, friends, and church better when I cook for them. There’s certainly nothing wrong with it, and I’m planning to continue doing so (watch for my next recipe coming out in late July on STC!). 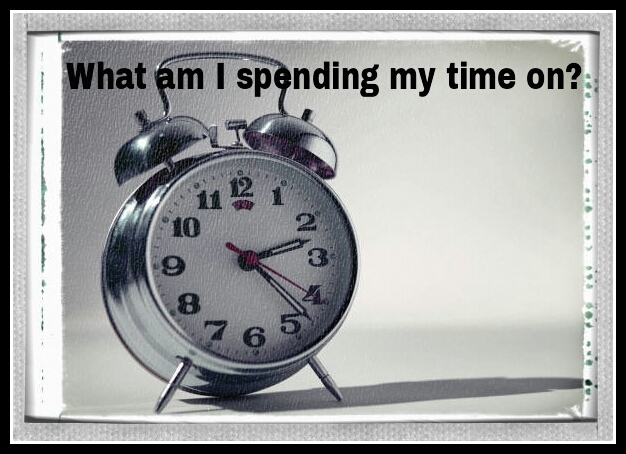 But how much time am I investing in things like reading and sharing recipes or playing Facebook games or watching TV or reading novels or any of the thousands of things we do every day that take up time but have no eternal significance? None of those things draw me closer to the Lord or train my children in godliness or feed my marriage or evangelize and disciple others or build up the body of Christ. Am I spending too much time on fluff and not enough on the things that really matter? We all need some down time. God made that clear when He set aside the Sabbath as a day of rest and worship back in Exodus 20:8-11. He doesn’t prohibit relaxation, He commands it and calls it good. But God’s ratio of work to rest is six to one. One day of rest for every six days of work. And as with so many of God’s other good gifts–food, money, fun, fellowship–my sinful flesh will knock things completely out of proportion in order to gratify itself. My cinnamon rolls are phenomenal (just sayin’!) but only as an occasional treat. If they constituted a major part of my regular diet, I’d be very unhealthy. It’s the same way with what I feed my spirit. If I’m constantly feeding on mental and spiritual junk food, I’ll be a very unhealthy Christian. I won’t have the time or the desire to exercise by serving God and those around me. Worse, I won’t have an appetite for what is supposed to be the staple of my diet: the Bread of Life– Christ. But if I keep Christ as my main dish and all of my side dishes, snacks, and desserts in healthy proportion to Him, I’ll be fit and ready to take up my cross daily and follow Him. And that’s a recipe for success, in God’s eyes. Who doesn’t love a lazy Saturday morning? It’s a great day to lounge around in your jammies with the family and enjoy a relaxing breakfast together. These cinnamon rolls are a hit with my kids. They ask me to make them nearly every weekend. The great thing about them is that they don’t take very long to make and they also freeze well, so you can make them Saturday morning or in advance. Preheat the oven to 425 degrees. Combine baking mix, milk, and mayonnaise to make a soft dough. Dust your counter top (don’t forget to clean it first!) or pastry mat with baking mix and knead the dough for about a minute. (If you don’t have a timer but do have more than one child, just time it from when Child A wanders into the kitchen and asks, “What’s for breakfast?” to when Child B walks in and asks the exact same question. That’ll be about a minute.) 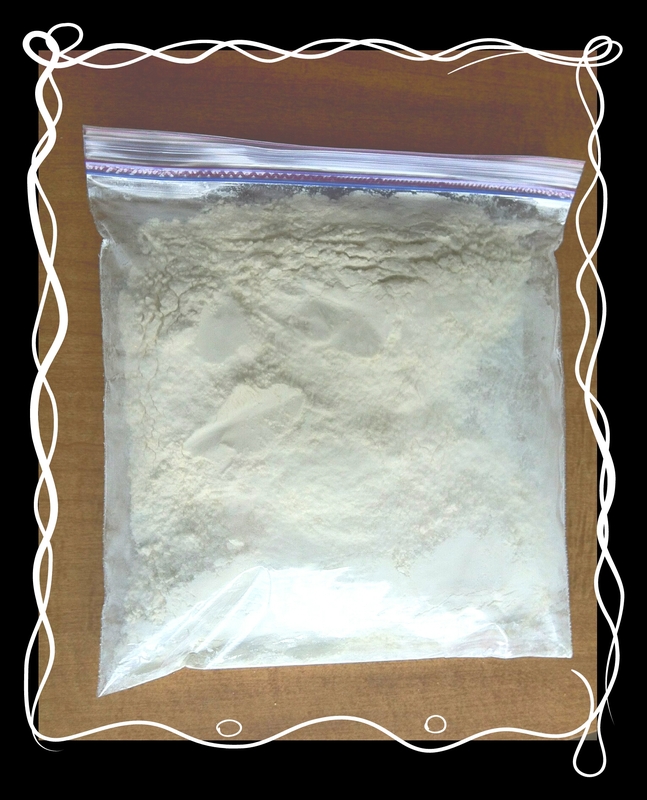 Roll the dough into a large rectangle, approximately 14″ x 18″. With a rubber spatula, spread a generous layer (more than you’d use to butter toast, but less than you’d use to frost a cupcake) of softened butter over the dough, being sure to go all the way to the edges. Crumble the brown sugar over the butter spreading it as evenly as you can (it may take a little more or less than 3/4 cup), and sprinkle cinnamon over the brown sugar. Starting with one of the longer sides, roll the dough up, jelly roll style. Slice the roll into pieces that are 3/4″ to 1″ wide. These things will come out of the oven absolutely cemented to your baking sheet, so grease it up any which way you can. I’d recommend spraying a non-stick pan with cooking spray, putting about 72 layers of parchment paper on top of that, and then spraying the whole thing again. Seriously, they are VERY sticky, so spray your pan really well or use parchment paper. 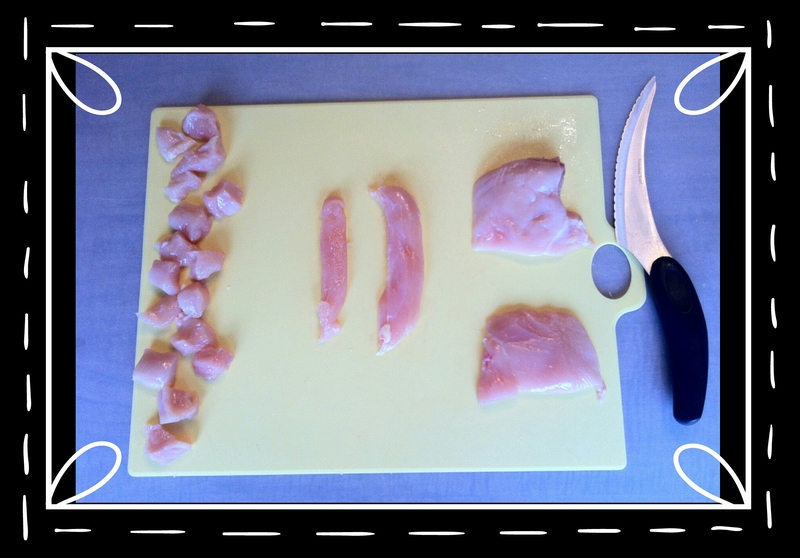 Lay each piece flat on the baking sheet and bake until the edges start turning brown (about 10-15 minutes). While the rolls are cooling slightly on the pan, make the icing. (If you put the icing on as soon as they come out of the oven, it will melt and run all over the place.) Depending on how many rolls you ended up with and how much icing you like, you might need more than one batch. Chisel them off the pan, and enjoy! We’ve all been there. The church service is over and everybody is caught up in the “after church hang around and fellowship time.” You hate to leave, but you’re getting awfully hungry. And so is everybody else. “Why don’t we all go grab something to eat?” someone suggests. And, of course, the one place everyone has a hankering for, the place that fries up the gospel bird better than anybody else, friend of hungry Christians everywhere, our beloved Chick-Fil-A…is closed on Sundays. Now, I am a huge fan of this fine Christian-owned establishment. Not only is their food great, but they do a lot of amazing things at both the local and national levels. So, I would never do anything to take your business away from them, and I encourage you to eat there Monday through Saturday. BUT, if you need your CFA fix on a Sunday (or if you’re one of those poor souls that doesn’t live near a CFA– How is this even possible? You should strongly consider moving. ), this knock off recipe should tide you over until you can “eat mor chikin”. 2. Whisk egg and milk together. Add the chicken to this mixture and let it sit in the fridge for about 30 minutes if possible (if not, this isn’t crucial, but let it sit as long as you can so the chicken will be juicier). 3. Mix dry ingredients in a plastic zipper bag, bowl or plate. 4. Heat oil to 375 degrees (medium high- if you’re a hack like me who doesn’t have one of those fancy thermometer thingies). 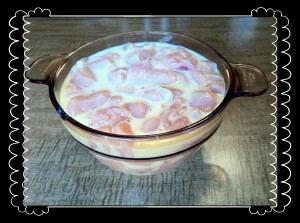 Dip your chicken pieces out of the milk mixture with a slotted spoon and dredge several pieces in the flour mixture. Fry until golden brown. Drain on a wire rack over newspaper. 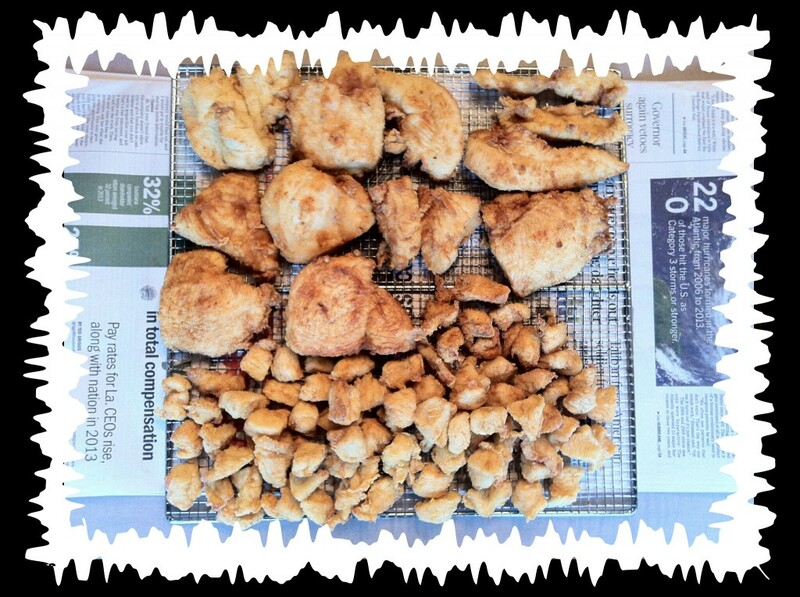 This is four full breasts (minus the half dozen nuggets I snacked on before taking the picture). 5. Serve on toasted buns with a pickle slice. (Be sure to rummage through the glove compartment of your car to see if you have any leftover Polynesian sauce to go with. If not, honey mustard or barbecue sauce are acceptable substitutes.) And don’t forget a side of waffle fries or french fries! 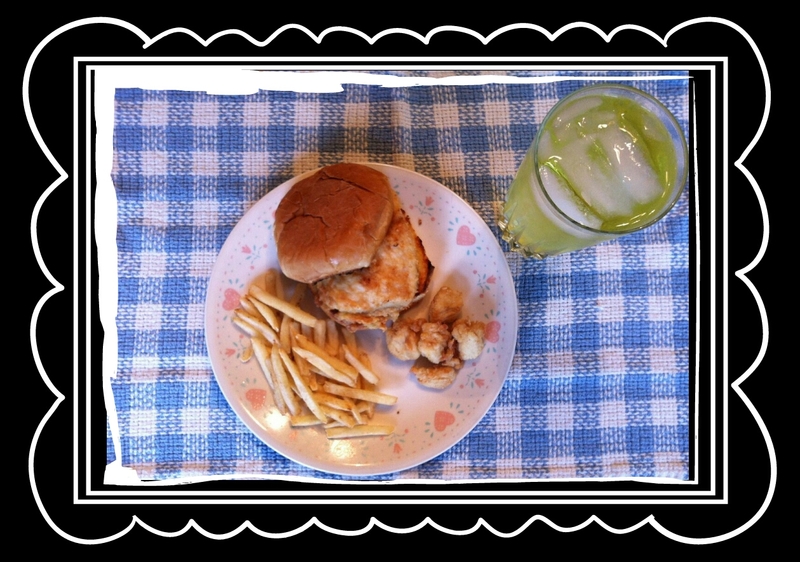 Want some great (not nearly as great as CFA’s, of course) lemonade to wash it down with? Mix 2 cups of lemon juice (bottled or fresh squeezed), 2 cups of sugar, and 13 cups of water. Makes 1 gallon. I’d love to hear back from you if you give this recipe a try.